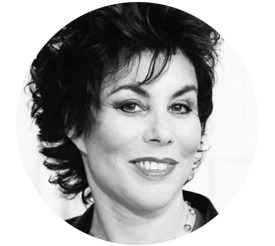 Ruby Wax was born in America and moved to the UK to attend the Royal Scottish Academy of Music and Drama. During twenty-five years with the BBC and Channel 4 she wrote and performed her own material, including her famous one-woman shows directed by Alan Rickman; the hit BBC comedy Absolutely Fabulous, which she script-edited; and TV interviews with major figures including Boris Yeltsin and the Duchess of York. Her memoir, How Do You Want Me? (2002), made the UK Sunday Times bestseller list. More recently, Wax has dedicated herself to mental-health awareness. Her new show and book, Sane New World (published by Perigee Books in November 2014), hopes to tackle stigma surrounding mental illness and increase public understanding of clinical depression.